Tuesday, Eric informed us that Andy Samberg would be at the O'Connell Center for free that night. I was really excited because...well...he is one of my many tv boyfriends (as I call them). So...Jenna, Eric, Chad, and myself pile in the car to go see Andy. When we finally got to the O'Connell Center it was deserted. Some guy walks by and we ask him about Andy. He tells us the event is next week. Man did we feel stupid. At least we didn't miss him...hopefully we can get a good seat this coming Tuesday. 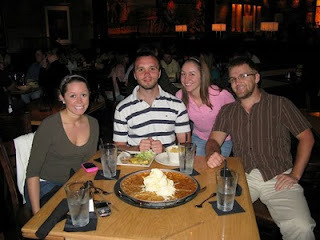 To mend our hearts broken from the disappointment we headed to the mall, then I took everyone to BJ's for a Pizookie Party Platter. This is a humongous cookie (4 kinds: Chocolate Chunk, White Chocolate Macadamia Nut, Peanut Butter, Oatmeal Raisin Walnut) with a pile of vanilla ice cream on top. Yum! The description of the desert asserts, "Perfect for groups of five or more!" We had four people and finished the whole thing off! 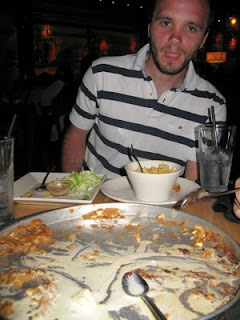 I think we all felt like how Chad looks in this picture after we finished the Pizookie (lol).